Route. 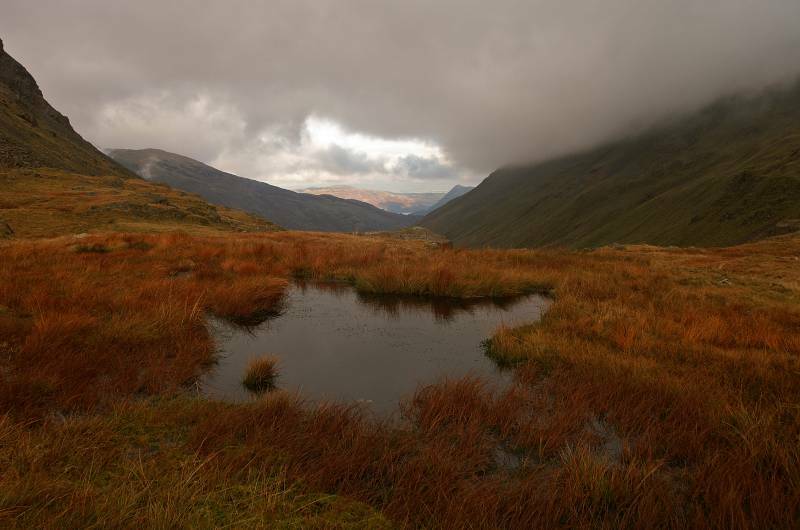 Glenridding - Greenside Road - Greenside Lead Mine - Keppel Cove - Whiteside Bank - Lower Man - Helvellyn - Nethermost Pike - Dollywaggon Pike - Grisedale Tarn - Deepdale Hause - St Sunday Crag - Birks - Thornhow End - Grisedale Bridge - Glenridding. Notes. 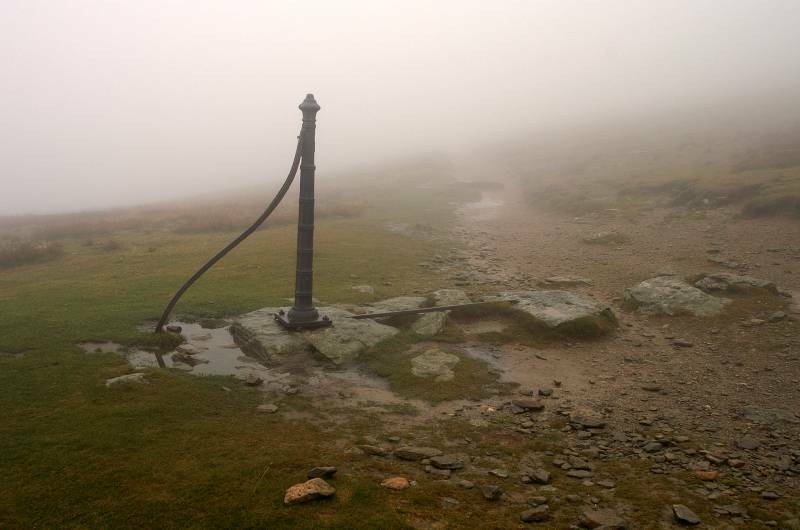 A strange sort of day on the fells today, my morning was spent wandering through thick fog accompanied by steady drizzle, extensive views about twenty feet. 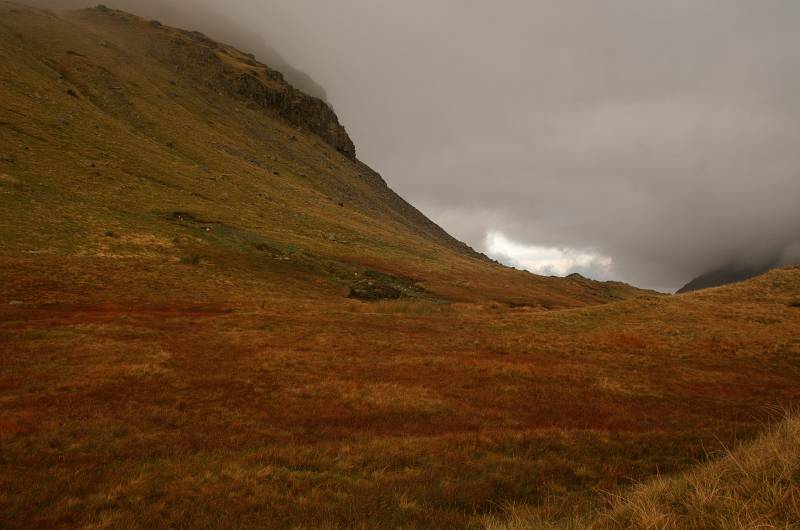 I promised myself if the weather didn't improve after lunch my day would end wandering down Grisedale. 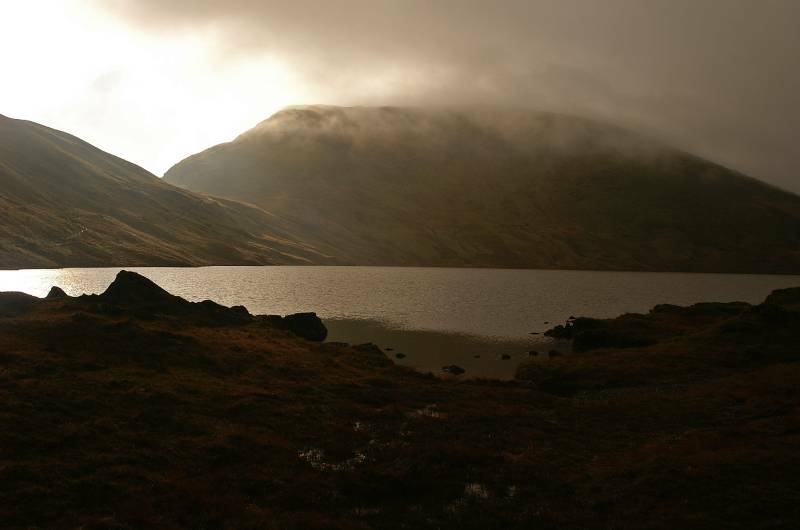 I was on my third cup of coffee when suddenly a shaft of sunlight cut across the surface of Grisedale Tarn, it was as if the Lake's were thanking me for putting up with their morning mood. 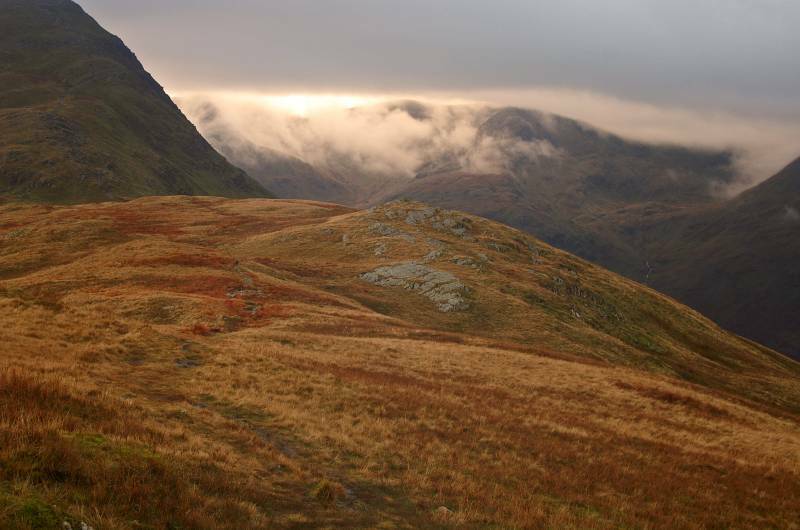 I packed my bag and headed up to Deepdale Hause, St Sunday Crag here I come. 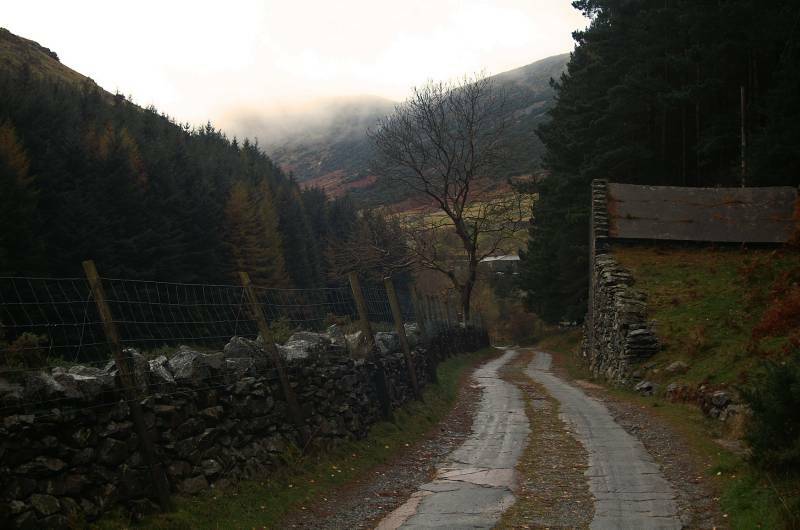 From the main car park in Glenridding I made my way up Greenside Road passing the remains of the Greenside Lead Mine en route to Keppel Cove. 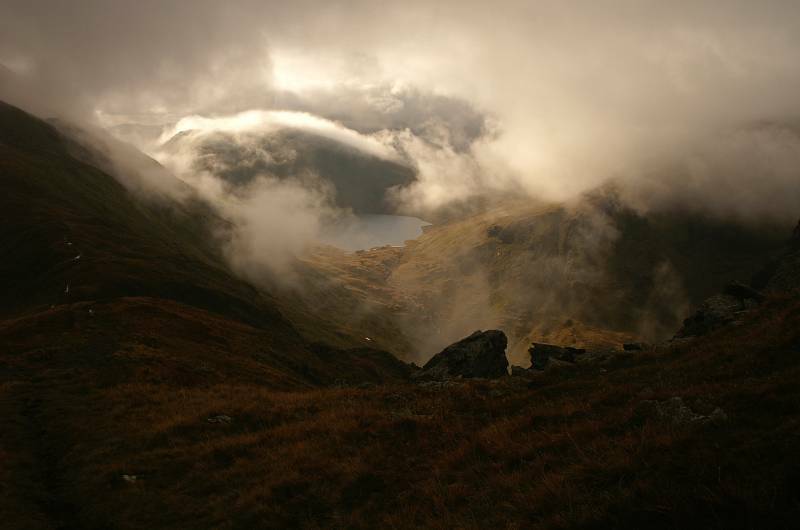 From the entrance to the cove a path zig-zags north to reach the coll between Raise and Whiteside Bank, I followed this ascending into mist and drizzle. 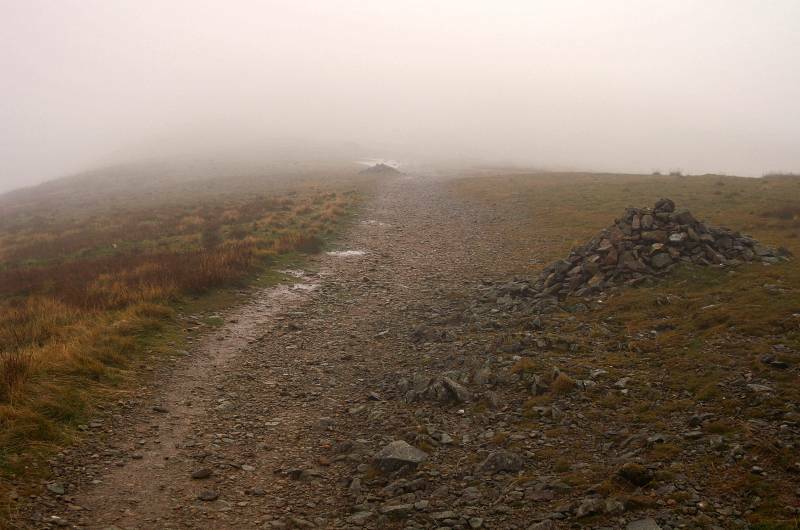 As I ascended Lower Man I found myself walking through the first snow of winter, onward to the summit of Helvellyn. From the summit on a well trod path I made my way south crossing Nethermost and Dollywaggon Pikes before the steep descent to Grisedale Tarn and lunch. 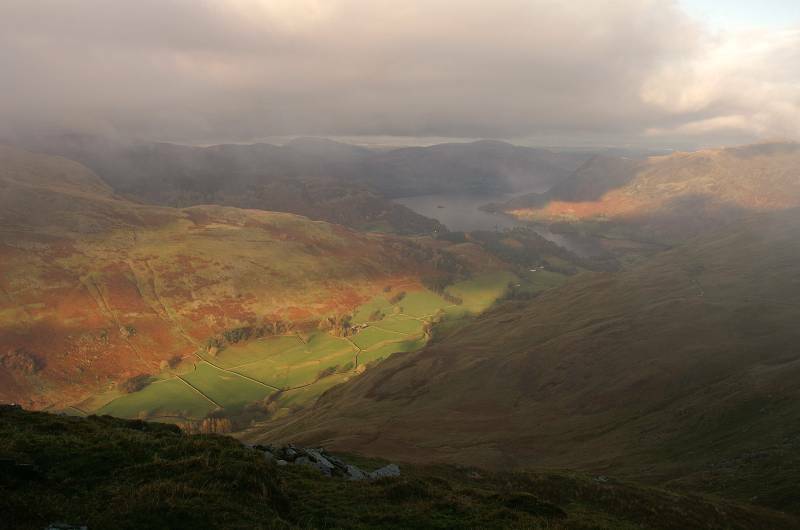 After lunch a promise to keep, the lakes provided sunshine, I had to ascend St Sunday Crag. 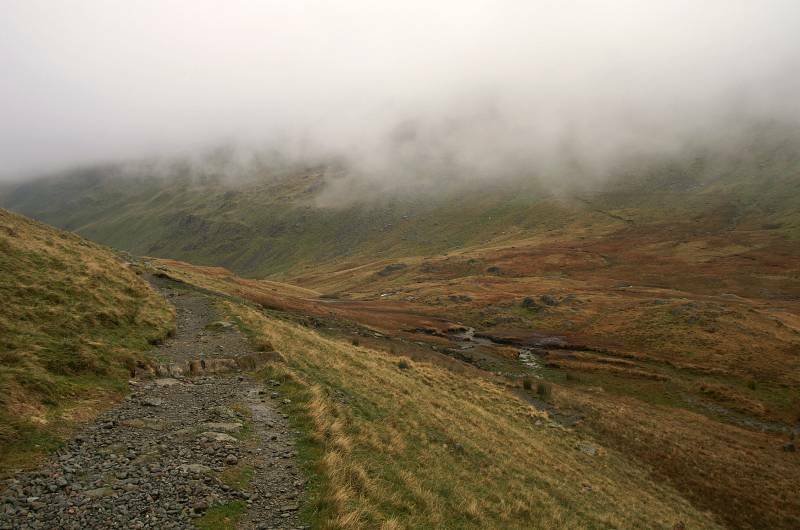 The path from Grisedale Tarn is a real classic, single file cutting across the mountains steep northern facade before winding it's way through long abandoned quarry workings to reach Deepdale Hause. 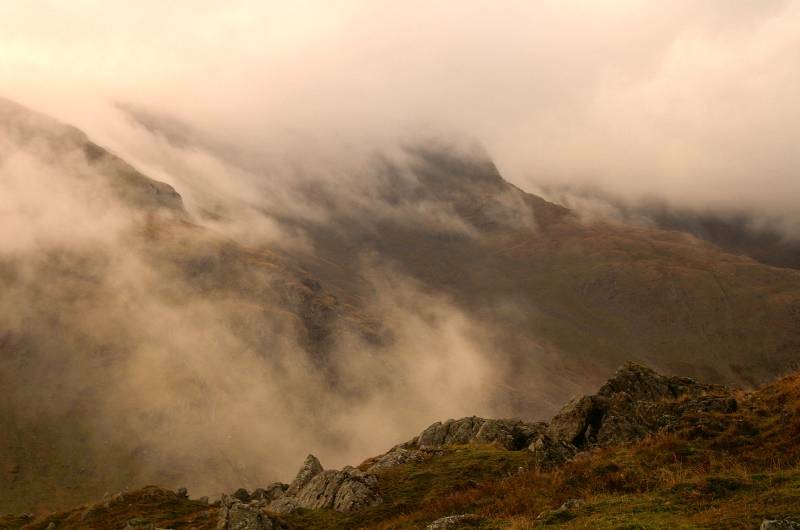 I ascended with every step gifting me with wonderful atmospheric views in all directions, on Deepdale Hause I turned left to ascend back into the mist almost passing the summit of St Sunday Crag unnoticed. I descended into sunshine once again before reaching the coll above Blind Cove, here a green path leads to the summit of Birks. After crossing the summit I made the steep descent to Thornhow End before finally reaching the valley floor at Grisedale Bridge, as day quickly turned to night all that remained was the short walk along the edge of Ullswater back to Glenridding. Nearing the Greenside Lead Mine, I presume the building to the right was once a gunpowder store, it's situated far enough away from the main buildings to be safe. I pea soup on the coll between Whiteside Bank and Raise. 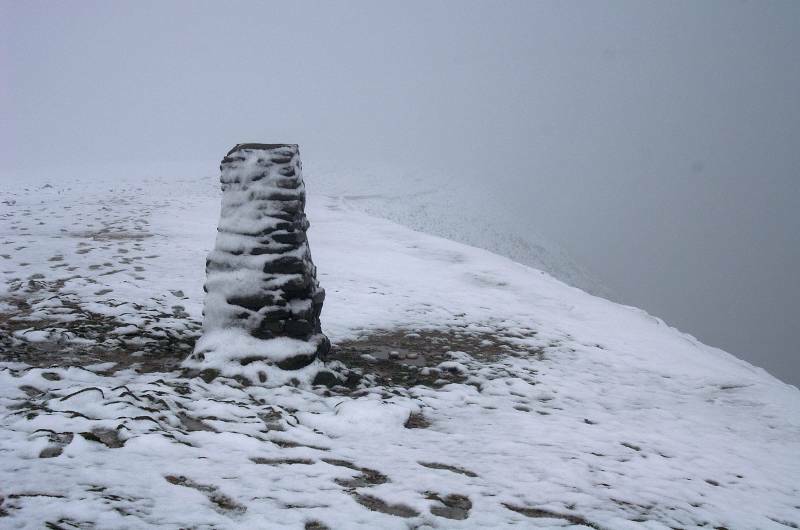 The trig point on Helvellyn. After crossing Nethermost Pike and Dollywaggon Pike I arrived at this old boundary fence, it marks the start of the steep descent to Grisedale Tarn. 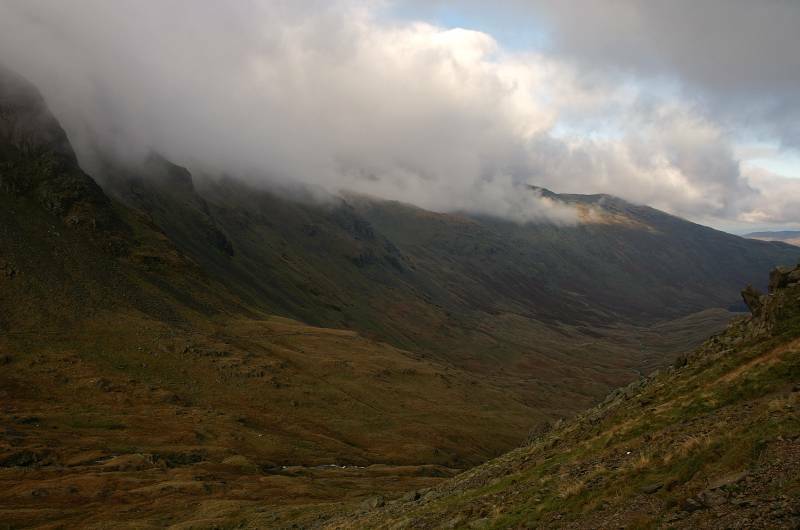 Dropping into the head of Grisedale, looking to the lower slopes of St Sunday Crag. 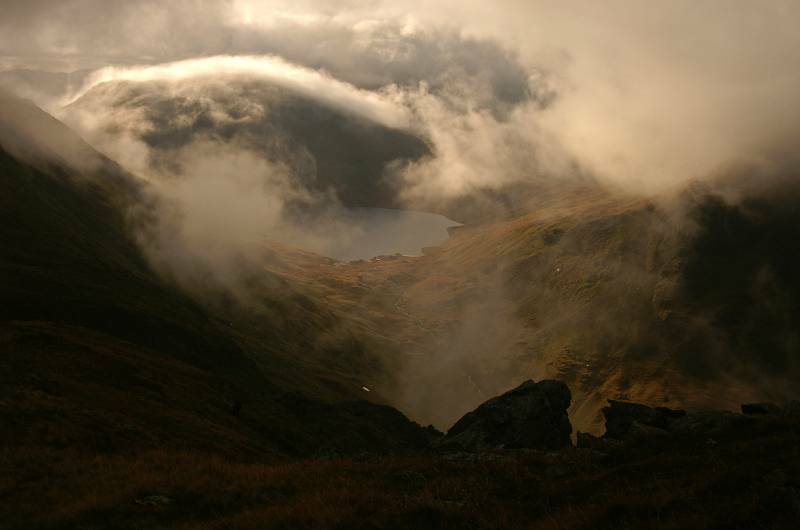 Looking over Grisedale Tarn with Seat Sandal rising into the cloud. From my perch on a rock having lunch, views to the cliffs of Dollywaggon Pike, "is that better weather I see in the distance". 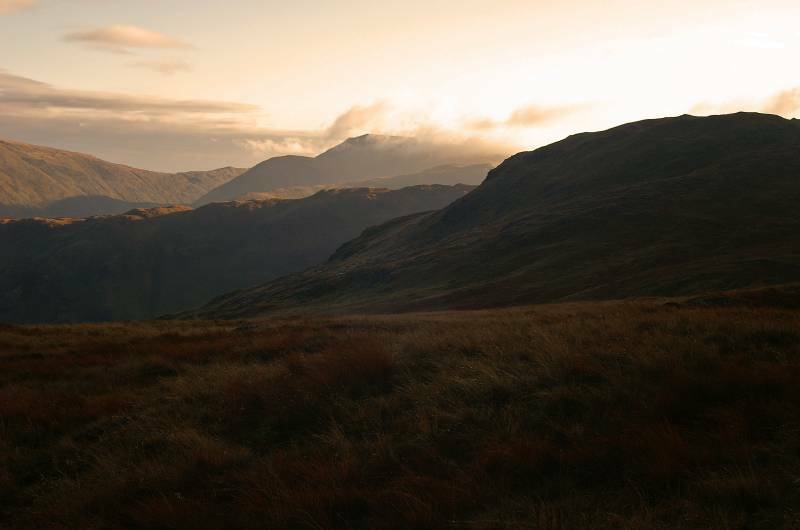 Rising above Grisedale Tarn, Seat Sandal with the first rays of sunlight piercing Hause Gap. 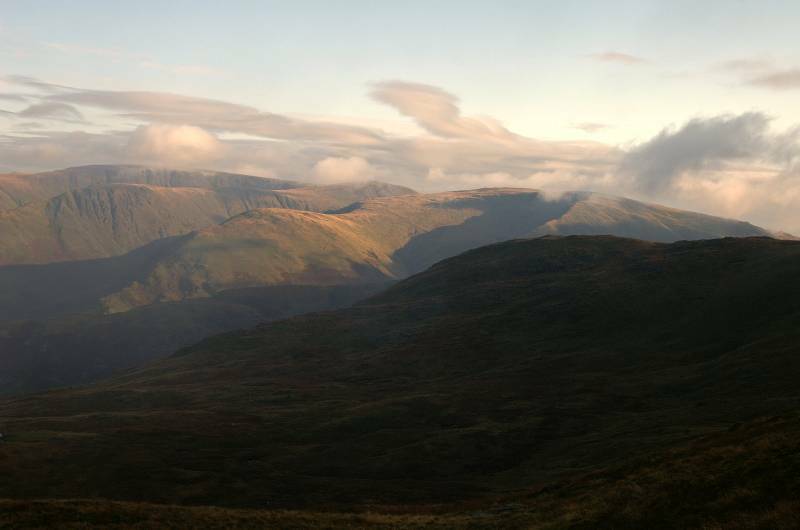 A stunning view from the head of Grisedale, the dark slopes of the Grisedale face of Birkhouse Moor dropping almost to Patterdale, in sunlight a distant Gowbarrow Fell, with it's head in cloud St Sunday Crag. 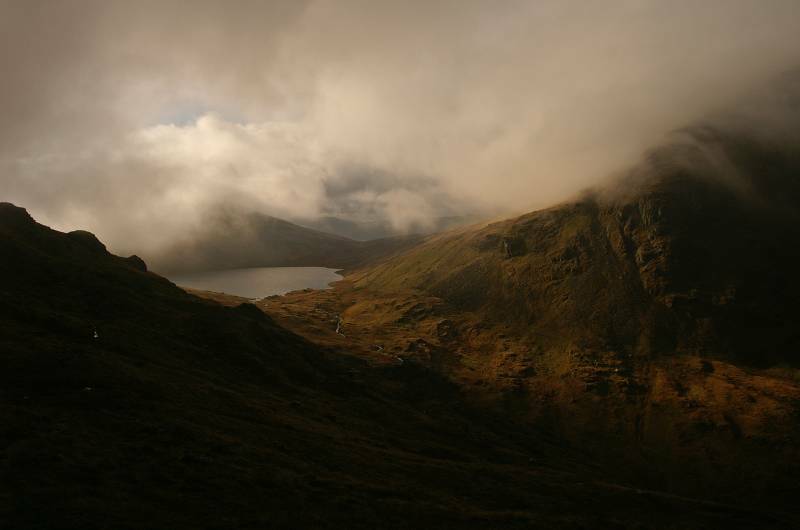 Under cloud Low and High Spying How, to the left the cliffs of Tarn Crag and Falcon Crag rising to the summit of Dollywaggon Pike. 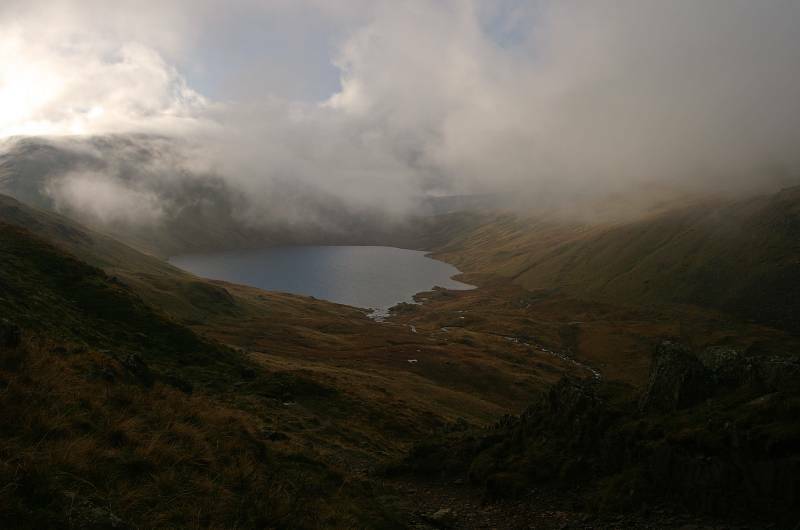 Ascending to Deepdale Hause, looking back on a stunning view of Grisedale Tarn. 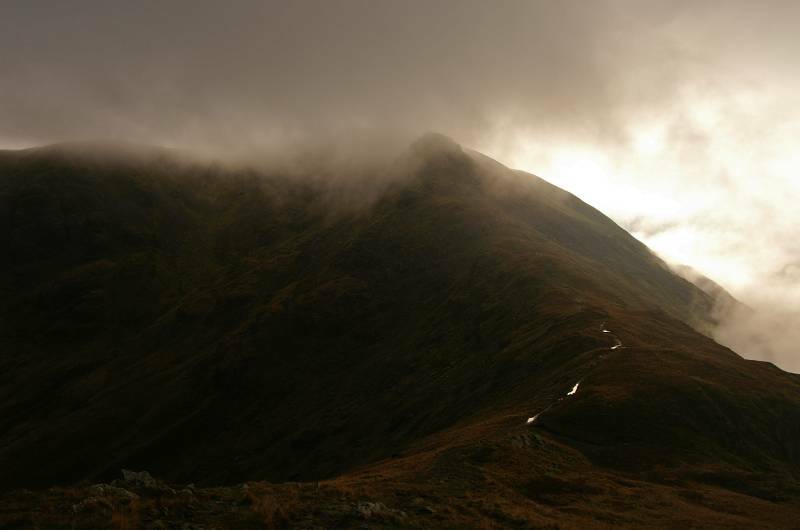 A dramatic view to the mighty head of Grisedale. 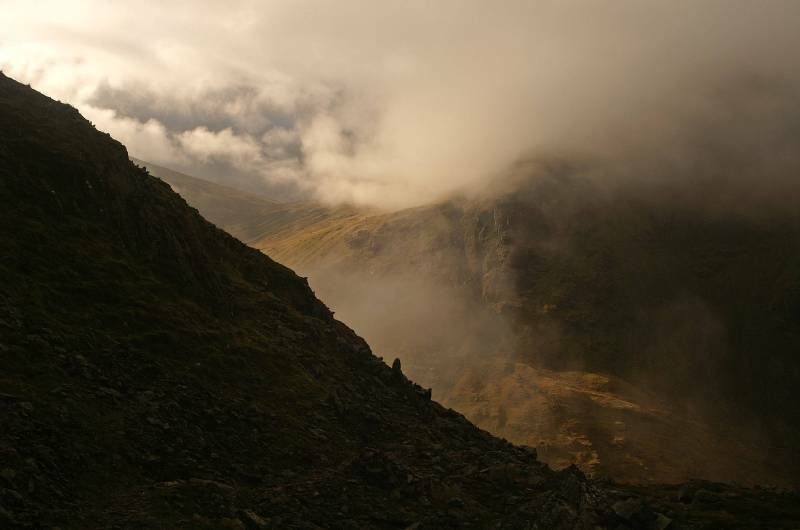 Cloud dances over the cliffs of Dollywaggon Pike. The striking view across Falcon Crag to The Tongue. 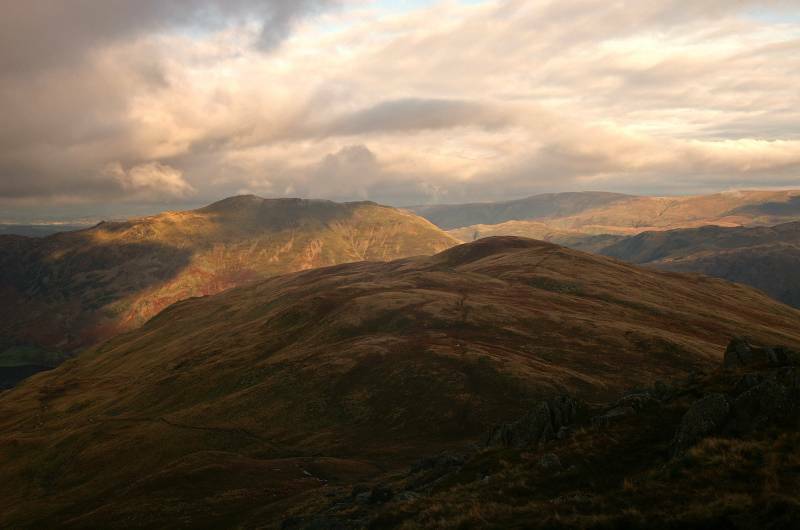 Spectacular views from the path over St Sunday Crag, Cofa Pike leading to Fairfield. Hart Crag seen across the head of Deepdale. 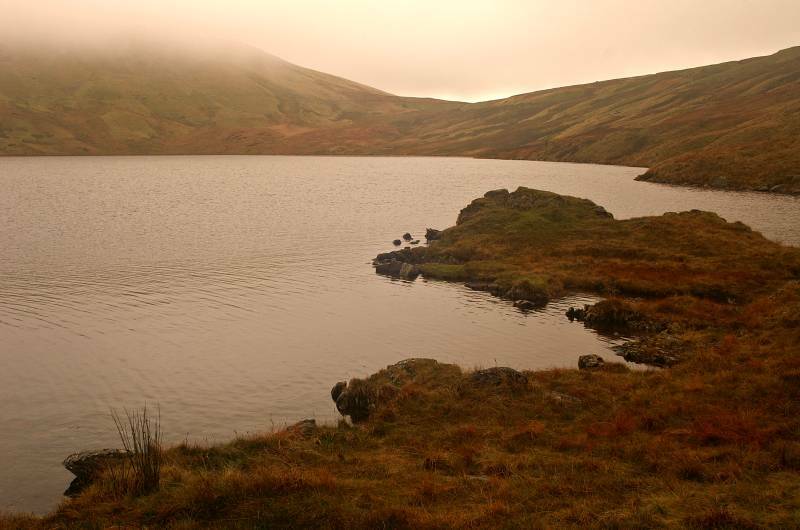 I'm about to be swallowed up in swirling mist, but first an awe-inspiring view to Grisedale Tarn. I think it's worth showing another, there was me and around twenty other people taking this shot. 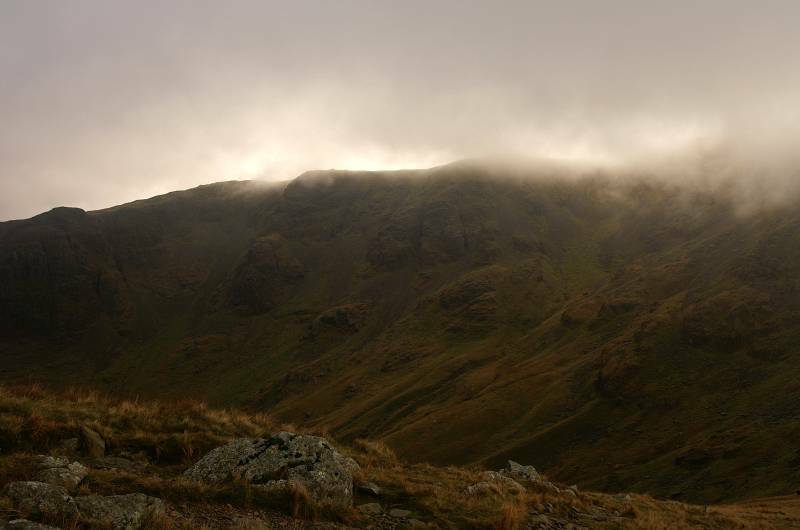 In the mist on the summit, St Sunday Crag. From the lofty heights above Pinnacle Ridge my first view to the green pastures of lower Grisedale. Viewing Ullswater from the steep descent. 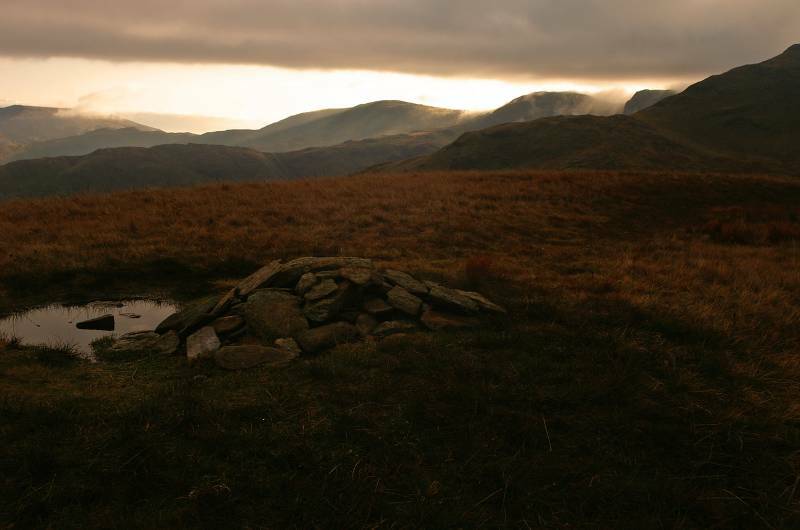 To the southeast Caudale Moor, with the long level summit of High Street reaching across the skyline. 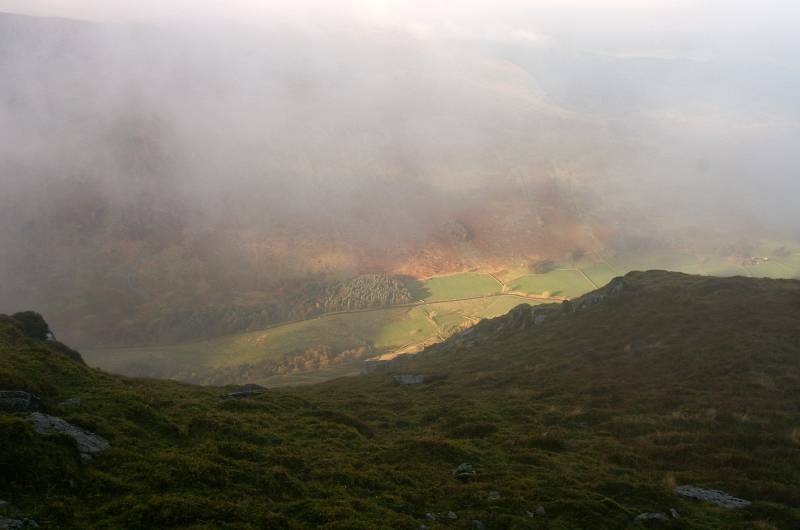 A magical view to Place Fell, seen over Birks. Near the summit of Birks viewing a distant Red Screes. The stunning view across Grisedale taking in Nethermost Pike with the steep slopes of St Sunday Crag to the left. 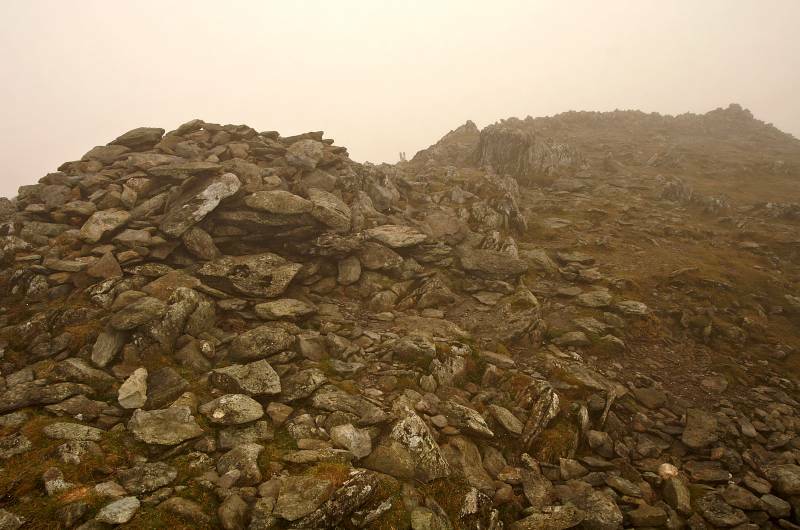 This small cairn marks the summit of Birks. 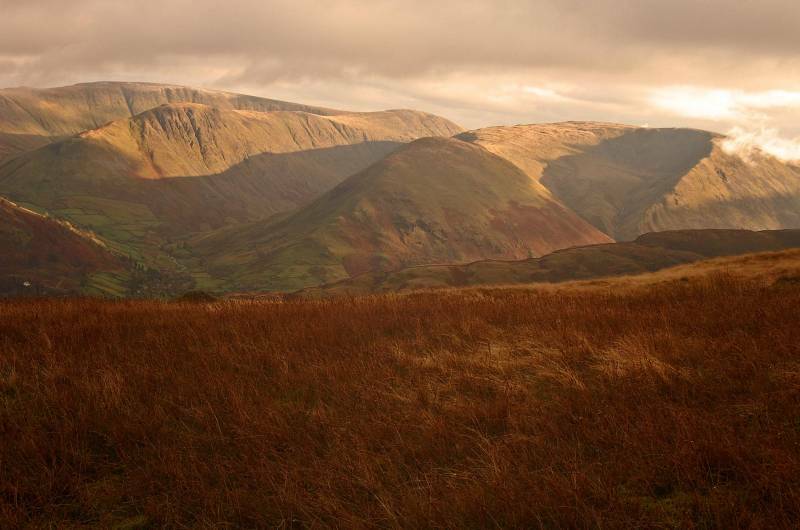 An impressive view to Hartsop, dwarfed by the giants of Gray Crag and Hartsop Dodd. 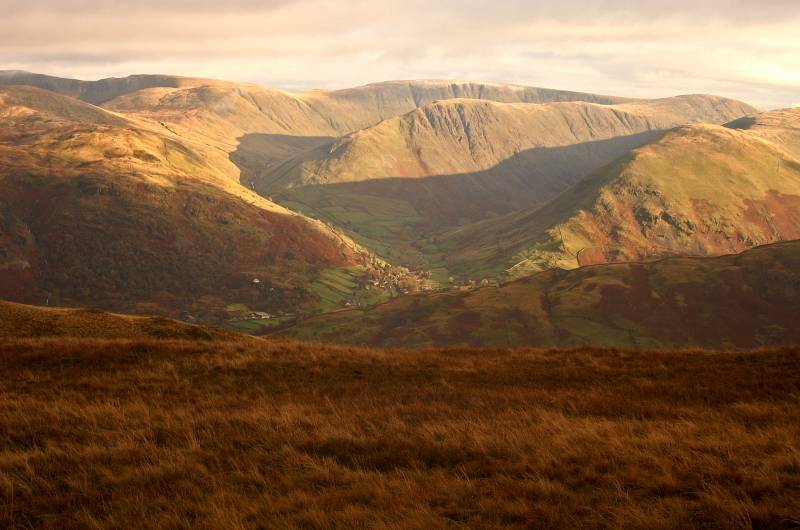 A grand view to Caudale Moor with Gray Crag to the left and High Street gracing the skyline. 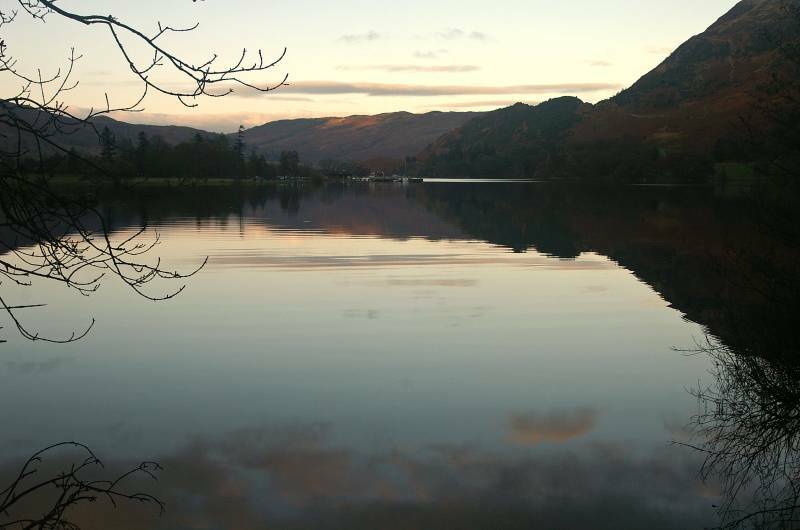 The mirrored surface of Ullswater reflects the late afternoon sky. 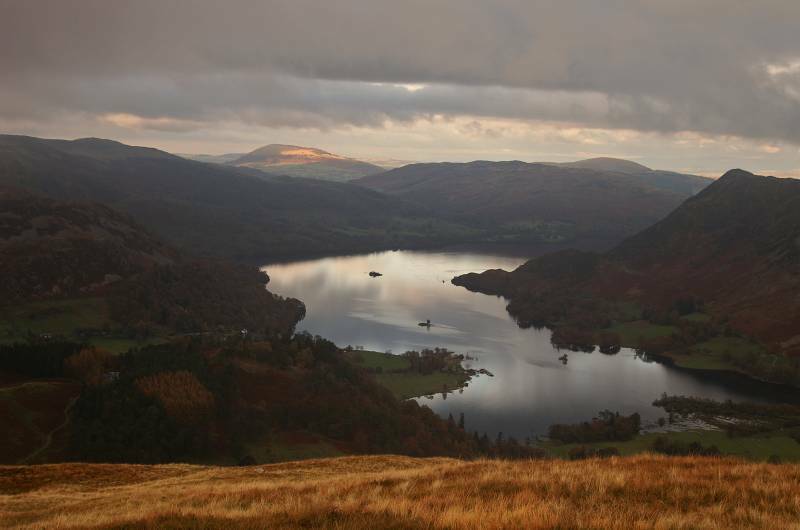 Wondrous views over Ullswater, seen from near the boat house as the last of the days light begins to fade.